Transport your doll to a world of fantasy dressed in our Celtic Green mermaid doll tail set! Sized just for 18-inch dolls, this two-piece, look-alike set includes a tail and top. Doll not included. 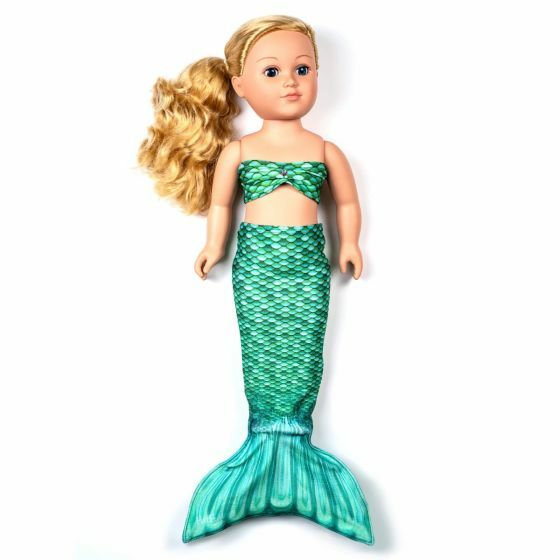 Transform your child’s favorite 18-inch doll into Ariel with Fin Fun’s Celtic Green doll tail set! Made of Fin Fun’s exclusive Mermaidens fabric, this doll tail set includes a fade-resistant mermaid tail and bikini top made of the same swimmable fabric available in sizes for kids and adults. Vibrant scales of green hues promote a realistic mermaid look worthy of any Ariel mermaid fan.